I just saw Disney/Marvel's Ant-man! While I had a few issues with it, there was one that really stuck with me. It's an issue that I've had with the MCU as a whole for a while. No, not its villains. Well, actually, yeah kinda of. So this is a little spoiler, but Hydra shows up in a minor role at the latter half of Ant-man. At that point I let out a sigh so deep and frustrated that my passive aggression miraculously spawned a dozen pointed post-it notes on roommates' fridges all across the state. I ask you, why? Why? Hydra is a fine villainous organization. (Most of the time. When its a bunch of ambitious fascists, it works, but when it's portrayed as a group of cartoonishly evil men in suits, it starts to lose its appeal.) But it's turning into the villainous organization. Its gotta stop. [caption id="" align="aligncenter" width="221"] We're being robbed of sweet half-capes[/caption] Now, first off, Hydra does have its place. As a chief antagonist for SHIELD in Agents of SHIELD? They're fine! The show needs a big antagonist to fight against. As a villain for Cap? Yeah, it was fine. I think that story is pretty much done now, don't you? A minor villain in Avengers? Sure, I can see it occasionally. However, they're quickly becoming the go-to antagonist club. The most frustrating part about it is that there are a bunch of other groups they could be using. AIM is already set up in the MCU, guys! I can think of a half dozen instances where they could've been used instead of Hydra! Perhaps it's out of a fear of presenting too many things in your shared universe. Having Hydra as a catch all bad guy group is pretty clean. If you had AIM and The Cabal and The Intelligentsia and who knows what else, you risk audience burn out. 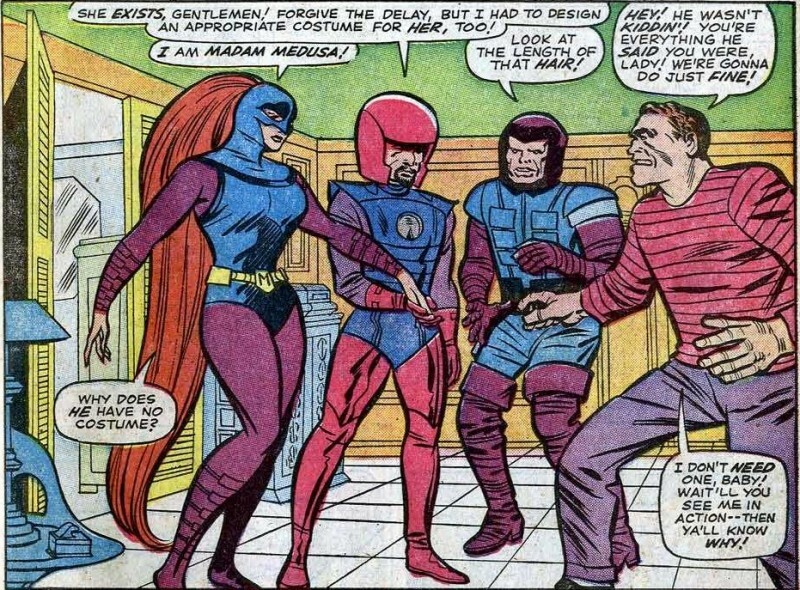 [caption id="attachment_72879" align="aligncenter" width="549"] We could be one step closer to the Frightful Four! The team that wields terrifying abilities like sand, hair, and various glues! [/caption] I think I'm more frustrated with the way they are usually just stuffed in. They pop up kind of suddenly in Ant-Man. It feels a bit lazy. Like "hey these people are from Evil, INC and they'd like to do bad things." It kind of feeds into Marvel's overall issues with making good villains. Also, lets not let Hydra itself off the hook. As I mentioned above, it can range from an intricate network of ambitious fascists to a laughably oversimplified group of Evil Businessmen. Regardless, in both instances they kinda fail to... I don't know, pop? The comic book Hydra is a vicious death cult. They have pizazz. MCU Hydra needs some pizazz. Get some crazy dudes in uniforms in there. Carry out some devastating suicide missions. Show how terrifying a powerful enemy unafraid to do what it takes to reach its goals is. I'm not sure how much they'll be a part of Phase Three, but then again I was sure we were done with them after Captain America: Winter Soldier. In any case, I hope that we see other villain groups. How cool would a group of mad scientists be for villains? AIM can give you that. Or a group of previous MCU villains? BAM! You've got yourself a Cabal. See how easy this is?